Singapore’s Raffles Place area with Ascott building; taken October 2018. Revenue for the quarter ended 30 September rose 6 percent on-year to S$134.5 million, it said in a filing to SGX before the market open on Thursday. The distribution per unit (DPU) increased 8 percent on-year in the quarter to 1.82 Singapore cents, up from 1.69 Singapore cents in the year-ago quarter, it said. “This was mainly underpinned by additional revenue from Ascott Orchard Singapore and DoubleTree by Hilton Hotel New York – Times Square South that were acquired in 2017, as well as higher revenue from existing properties,” Ascott Residence Trust said in the statement. Daiwa had forecast revenue of S$138.7 million and DPU of 1.93 Singapore cents. 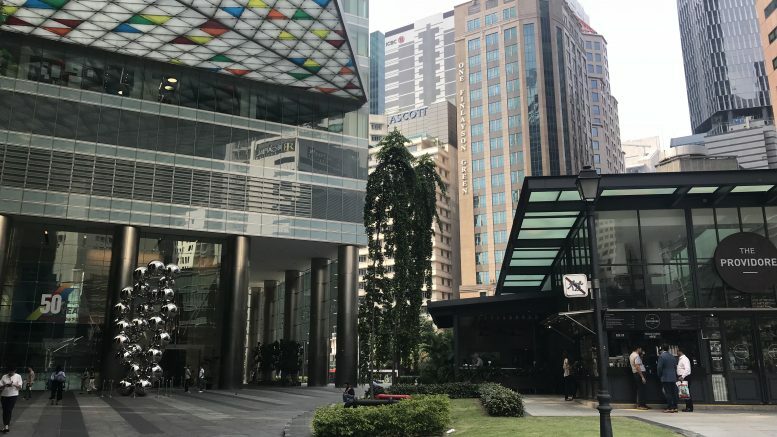 Bob Tan, chairman of Ascott Residence Trust’s manager, Ascott Residence Trust Management Ltd. (ARTML), said that the trust had debt headroom of around S$810 million, providing the financial flexibility to make further acquisitions, either from its sponsor Ascott or from third parties. “In September, we acquired a prime greenfield site to build our first coliving property. This will be our maiden development project which will allow us to enjoy development profits,” Tan said. The site is in Singapore and was acquired for S$62.4 million, it said, noting it would be named lyf one-north Singapore. It will be targeting the millennial and “millennial-minded” market, Ascott Residence Trust said. Ascott REIT has a portfolio of 73 properties, with 11,430 units across 14 countries in the Americas, Asia Pacific and Europe.